The Story of the Lord and His devotees. Concatenated, read and with the previous edition added. Plus links to the Sanskrit and word for word translation. Lord Krishna's sermon on the field. Concatenated, read, with the previous version, plus the links to the Sanskrit word for word presentation and translation of Swami Prabhupâda. The music, de mantras, of the disciplic succession. The paintings of the devotion around Krishna as also the bhajans as composed by the âcârya's. All names and basic terms described and linked up. A dictionary Sanskrit-English of [almost] all the Sanskriet terms used. Files for quickly looking up a word or to load in an e-book reader. - Anand Aadhar Prabhu: Translations, articles. also offers the Bhâgavata Wiki - Contribute! - Colin Meijer's Krishna Art: Krishna drawings. - Kadamba Kânana Swami - Official homepage. - Madhava Priya devî dâsî: Paintings. - Nandanandana dâsa: Vaishnava articles and links. - Prithu das Adhikâri : Jezus and Krishna. - Sakhya Devî dâsî: Krishna and Baba. - S'rî Hayes'var das (Hendrik van Teylingen): memorial site (Dutch only). - Vladimir Holst: Krishna-conscious paintings. - Uddhava Das: library 108, CD-shop. 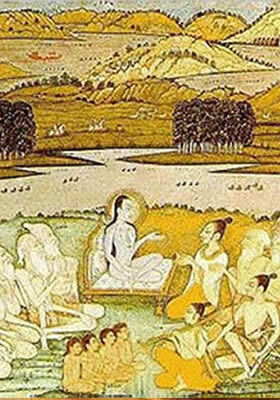 Gauranga Premananda Das e.a. : Onbekend maakt Onbemind: de Nederlandse Hindoe in Beeld! - Pushkar's Painting Gallery: ISKCON paintings. - Aka Janmanalaya (Johannes Ptok): expressive Krishna-conscious art. - Drigha Dasi (Dominique Amendola). Painted some well-known works of Krishna-conscious art. - Stephen Knapp: prolific Krishna-conscious writer and webmaster. With an art gallery of free to use images. - Parividha Das: Vedic theatre artist. His musicals and dramas are about pastimes of the Lord or His devotees. In the comedies he has tried to get one or more philosophical points across. - Bhakta ( Monroe) René: Self Realization. Introduction to spirituality, the theory of the process and the enlightened state of consciousness. - Ananda Swarupa: Karma Free Trust. Downloads of the Krishna-book and the Teachings of Lord Caitanya in epub. N.B. bhagavata.net takes no responsibility for what is propagated at individual sites of devotees but is only aiming at mutual respect between devotees. on the condition of a selfless practice.